What they are, what they do, and when to use them. There is an old saying. If is moving and it's not supposed to move, use duck tape (yes duck NOT duct, look it up :) . If it’s not moving and its supposed to move, use WD40. Well it's a nice thing to say while enjoying a cold beverage in the garage with your buddies, but reality is a bit more complicated than that. So lets talk about how to keep fasteners moving when they should, and not moving when they shouldn't. I consider this essential knowledge for anyone who rides a dirtbike. It should be taught to 3 grade students along with reading, 'righting and 'rithmatic. Thread galling is a common, yet seldom understood problem with threaded fasteners. Galling, often referred to as a cold-welding process, can occur when the surfaces of male and female threads are placed under heavy pressure. The frustrating aspect of fastener galling is that galled nuts and bolts may pass all required inspections (threads, material, mechanical, etc. ), yet they still fail to function together. Stainless steel fasteners are particularly susceptible to thread galling, although it also occurs in other alloys that self-generate an oxide surface film, such as aluminum and titanium. During the tightening of the fastener, pressure builds between the contacting thread surfaces and breaks down the protective oxide coatings. With the absence of the oxide coating, the metal high points of the threads are exposed to one another, which increases friction. The combination of these two events can generate enough heat to fuse and seize the nut and bolt together. Minor galling may cause only slight damage to the thread surface and the installer may still be able to remove the fastener. However, in severe cases galling can completely weld the nut and bolt together and prevent removal of the fastener. If the tightening process is continued once galling begins, the fastener may be twisted off or have its threads stripped. Note the materials mentioned: Stainless steel, aluminum and titanium. Have a look at you motorcycle and note the locations where fasteners are in contact with these materials. I will save you some time, it's almost every screw on your ride. Am I suggesting that you apply anti-seize to every screw you remove from your bike? No, but there are specific cases where you should. The first place that anti-seize should be applied is your spark plug. Let's look at the environment that a spark plug lives in. We have a steel plug case, with a very fine thread, that screws into an aluminium head that gets really hot. Let's look at the places where anti-seize using is a good thing: aluminum threads, high torque, high temperatures and galvanic corrosion (steel meets aluminum); put anti-seize or your spark plug threads, it’s a no-brainer. Make sure you do this on your four wheeled vehicle too when changing plugs and avoid ripping the threads out next plug change. Just be careful and put on a thin coat and avoid the last few threads on the plug. If you slop it on, there is a chance the grease could get onto the electrode shorting it out. Anti-seize on the exhaust mounting screws is also a good idea. Anti-seize is nasty stuff, it gets everywhere and for some reason just doesn't come off. 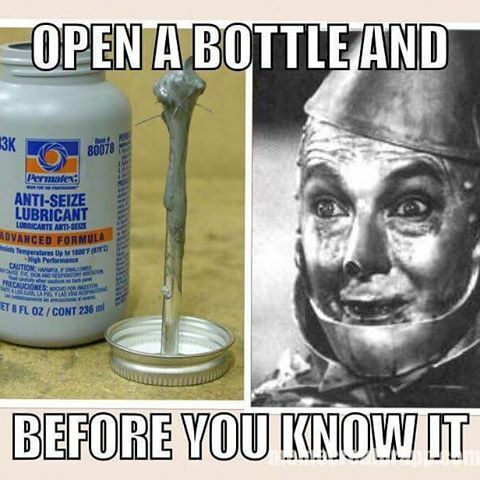 Don't end up looking like the tin man, just use a decent waterproof grease for your axles. So in summary, if the screw (or nut) touches aluminum, is made of steel or operates in a high torque or high-heat environment, apply anti-seize. So anti-seize prevents fasteners from seizing up, so you would think that thread locker does the opposite; it prevents the screw from coming out, and you would be correct. But like anti-seize, it also prevents the screw from seizing up. Thread locker lubricates the thread on assembly, but more importantly it seals water out of the thread and provides some isolation between the dissimilar metals, slowing down galvanic corrosion. Thread locker keeps your screws from rusting into place. That’s a good thing, but the main reason to apply thread locker to keep your screws from falling it when then shouldn't. If you don't use thread locker on your motorcycle, you should, period. I have no sympathy for guys who have to stop and zip tie an exhaust on because the mounting screw rattled out. Spend $7, get some thread locker and use it. But what is the best way to use it? First of all you need to get the correct stuff. There are a dozen different kinds of thread locker, all with slightly different properties. But 95% of the time, you will use the medium strength, blue colored stuff you can buy at any hardware store. It also come in different forms. You can buy the gel, stick, liquid or even a tape. I find the gel works fine for most applications. It stays on and you waste less. 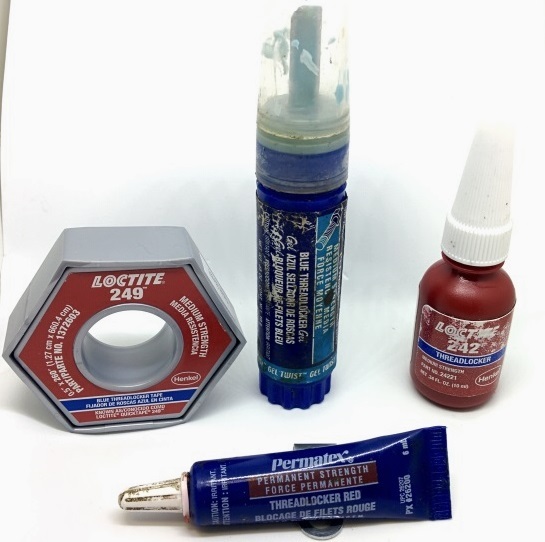 Some are more oil tolerant, but generally the blue stuff is not, so it is important that the fastener (and the mating hole) be clean from oil before you apply it or it will not harden correctly. A quick blast with brake cleaner is a good idea. BTW, if you have ever tasted thread locker, it tastes sweet. The Loctite rep told me that’s because it contains saccharine. I don’t suggest putting it in your coffee, there are much more cost effective ways to make a double-double. Spray some on before you apply the thread locker, and it's all good. 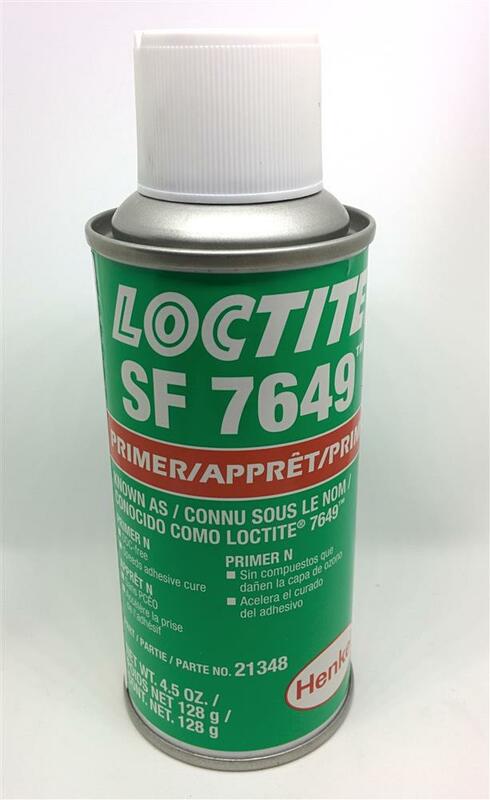 The primer also signicantly speeds up the cure time of the thread locker, so its a good idea to spray it on if you intend to ride the bike right away. So which fasteners should receive the thread locker treatment? The short answer is almost everything. Sometimes larger nuts or bolts don't require it (wheel nuts etc. ), but otherwise use it. Sometimes the stuff works to well, and the fastener can be difficult to remove. In these cases, a shot of heat will loosen it up and allow you to remove the screw. 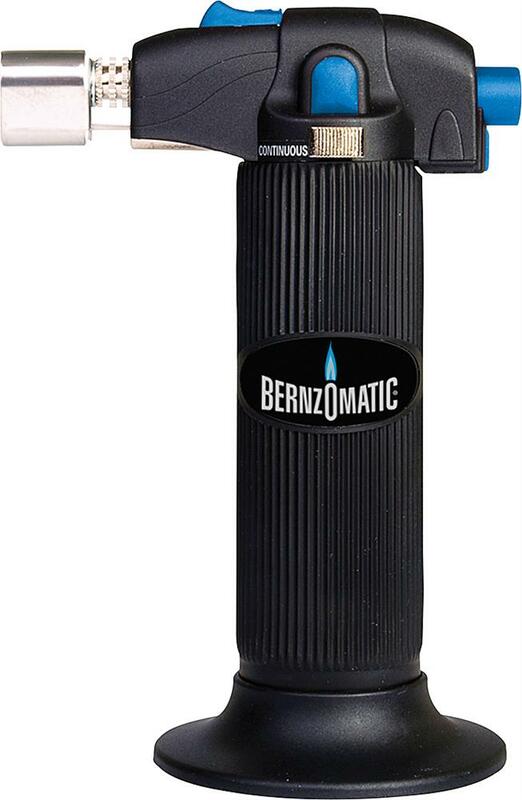 This little torch is excellent for this, you can get a hot, precise flame right on the fastener. Its also good at making crème brulees. Summary: If it's hot, mates with a dissimilar metals, has high torque or specific torque requirements, apply anti-seize. If you don’t want to your bike rattling to pieces out on the trail, use thread locker. Bottom Line: You need to put something on that screw before you put it back in.